An environment that encourages exploration and physical development is important for children of all ages. Be sure to allow your baby plenty of space for rolling, scooting and, eventually, crawling. Babies like to grasp and manipulate objects, so be sure you have rattles and other safe toys within easy reach. Make it a habit to wash the toys your baby puts in her mouth on a daily basis. Babies love to look at and reach for moving objects such as mobiles or streamers. Be sure to hang them safely. Play allows children to try out and practice new skills. Your children need opportunities to develop upper body strength by rolling balls and throwing bean bags, and later by pulling themselves up, hanging, and swinging. They need opportunities to strengthen their lower bodies by running, jumping and balancing. Encourage your children to try a variety of physical activities, involving large- and small-muscle skills, but try not to pressure or demand that they excel at every physical task. Remember that children need lots of time and space for energetic, noisy play. Using crayons, stringing beads, and doing puzzles are all good ways to help children develop fine-motor skills and eye-hand coordination. These kinds of activities can be tiring for young children, so don't expect them to work at such skills for long stretches. Hands-on activities allow children to develop all their senses: sight, touch, hearing, smell, and taste. Encourage them to compare the way different objects look, sound, feel, or smell. As they grow, introduce new foods so they get used to a variety of tastes. As your children become more physically active, it can be difficult to draw the line between taking sensible safety precautions and being overprotective. The goal is to maintain a high level of safety while allowing your children to experiment with mild risks that build feelings of competence as they are met and mastered. As your child grows, experience will be your guide. 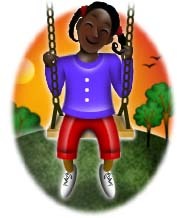 A basic safety guideline is to avoid lifting your child onto play equipment that he cannot climb onto by himself. (Swings are the exception.) Playgrounds should have soft surfaces (such as sand or rubber) to buffer falls. Be sure that your children's immunizations are up to date. Keep contagious children at home. Hand-washing is the single most effective way to avoid spreading disease. Children and adults should get used to washing hands before handling food and after diapering, toileting, or blowing their noses.